Plastic Coated Steel Cables – Aero Assemblies, Inc. Plastic coated cables and wire ropes are popular in a number of industries as they offer increased protection and improved aesthetics over traditional metal cables as they are available in a number of colors and textures. Though not often used in the heavy lifting and hoisting operations for which wire ropes are most commonly known, plastic coated cables are optimal for consumer goods and applications in which increased abrasion and corrosion resistance and cost-effectiveness are desired. Though the work is often less strenuous the goal of easier lifting and hoisting is still applicable to plastic coated cables which also afford increased durability. Fitness industries use plastic coated cable in most weight machines; theater industries use black powder coated cables for stage rigging; outdoor playground equipment often use plastic coated cables, and many types of electronic equipment, communications devices, and medical devices use miniature wire rope and wire rope fittings. Plastic jackets are also used when complete adherence to the wire or cable is not necessary. Casings made of non-plastics may be coated in plastics for added water resistance, visual appeal, etc. 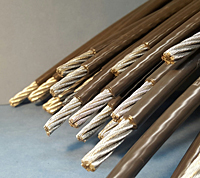 In all applications, the construction of both the wire cable and the coating itself should be carefully considered to avoid mechanical failure or ill-performance. Cables coated in plastic begin construction in much the same way as non-coated wire ropes. Spools of Coated Cable – Tyler Madison, Inc. There are three basic components: metal wire filaments, strands, and cores. Filaments, cold drawn metal rods of relatively small diameter, are twisted or braided to form strands. These strands may consist of two or several dozen filaments and are wrapped in a helical pattern around a core which may be metal, fiber, or polymer based. 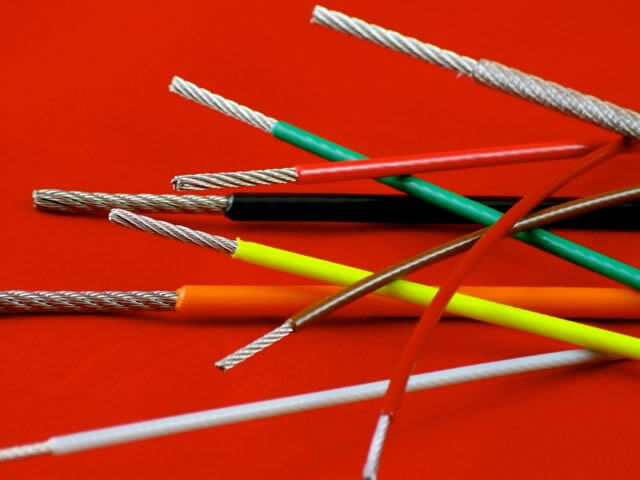 In addition to identifications based on all materials used, plastic coated stranded wires are identified by both the number of strands per cable and the number of filaments per strand respectively. Further considerations include overall diameter, difficulty of flattening, temperature resistance, average lifespan, and material construction. The wires themselves are often fabricated from steel, stainless steel or galvanized steel, and then coated in either nylon or vinyl (PVC), although polyethylene coatings are applied for electrical insulation and polypropylene coating is used when chemical resistance is required. Vinyl coating is the most common since it is by far the most cost-effective; although vinyl coated cables do not have optimal abrasion and fatigue resistance, they have better flexibility and UV light resistance than nylon coated cables. Nylon cables have excellent impact, abrasion, wear, and acid resistance, although the nylon coating degrades quickly under UV light. Material choice is largely determined by the intended use for a cable. The rope can be coated at any stage of construction, whether individually coated filaments or an assembled cable. Plastic Coated Cable Plastic coated cables are wire ropes that have been treated with a polymer or rubber coat or casing to allow for increased wear, flexibility, and easy handling.